Just 14 months ago, the Tooele County Commission was laying off workers and cutting benefits to adjust expenses to fit reduced revenue. Last Tuesday night, the commission gave all county employees, including elected officials, a 3.75 percent Cost of Living Adjustment. While the decision to extend the COLA to merit employees was unanimous, the resolution to raise the salary of elected officials and their chief deputies passed with a 2-1 vote. Milne gave the lone dissenting vote. Milne was careful to distinguish between a COLA and a pay raise. The county traditionally gave employees an annual COLA tied to the increase in cost of living expenses prior to the Great Recession, according to Jami McCart, Tooele County human resources director. However, since 2010 employees only received one COLA of 1.5 percent in 2012, according to McCart. Indicators used by most companies to set COLAs went up during the five years between 2010 and 2014, she added. The federal government increased social security and supplemental social security income payments in 2012, 2103 and 2014 by 3.6, 1.7, and 1.5 percent, respectively. The Bureau of Labor Statistics national consumer price index also went up each year from 2010 to the first half of 2014. Tooele County employees used the public hearing on the mid-year budget adjustments that included the cost of living increase for merit employees to thank the commission for the pay increase. Wayne Anderton, a roads department worker and chairman of the Utah Public Employee Association’s Tooele chapter, thanked the commissioners. 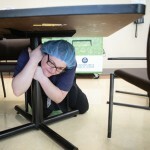 Rachel Hester, Tooele City resident and Democratic candidate for county treasurer, agreed that county employees deserved a raise, but opposed the raise for elected officials. 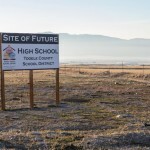 David Vice, Tooele City resident, suggested that the salary for a county commissioner should be tied to the average salary of a Tooele County resident. 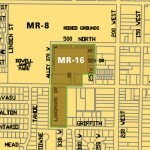 Vicki Griffith, Tooele County resident and former candidate for county commissioner, disagreed with Hester and Vice. Gary Searle, whose salary as the chief deputy county attorney was included in the resolution to raise elected officials salary, spoke in favor of the COLA adjustment for all employees, including elected officials. 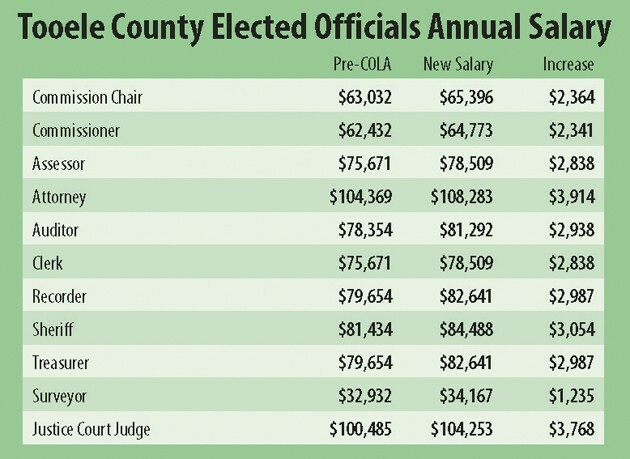 The mid-year salary adjustment will not require an increase in the county’s overall budgeted expenses for 2014 because the county commissioners included $220,000 in the human resources budget for a potential salary adjustment if financial conditions indicated that an adjustment was feasible, said Tooele County Auditor Mike Jensen. The increase for elected officials is roughly 5 percent of the total amount of the approved salary increase, according to Jensen. I wish I could vote myself a raise. I haven’t had one in 8 YEARS, yet taxes go up.